Meredith Lang and Interim Principal Linda Cimusz. Due to initiatives to include computer science education in its curriculum, Bishop Timon – St. Jude High School recently received the Accomplished School Award presented at the Western New York Principals’ Summit held at Buffalo State College on April 10. Interim Principal Linda Cimusz and Meredith Lang, Science Remediation Instructor, accepted the award at the Computer Science for All in Western New York Principals’ Summit. “I am very excited to be a part of the team helping to bring hands-on computer science classes to the students at Bishop Timon – St. Jude High School! In today’s fast-paced world, we are driven by technology. Providing educational opportunities to learn more about computers will give our students an edge over others, helping to make them job ready and better prepare them for the technological challenges they will face in both their academic and professional futures,” Lang commented. The event included a dinner sponsored by Google, several keynote addresses by leading professionals from the National Science Foundation and Google Education Strategy, and conferring of awards to the attending principals. Keynote speakers included Dr. Melanie Perreault, Provost, SUNY Buffalo State; Dr. Chris Stephenson, Head of Computer Science Education Strategy, Google; Dr. Neal Mazur, Chair, Computer Information Systems Department, SUNY Buffalo State; and Dr. Jan Cuny, National Science Foundation. “Bishop Timon – St. Jude High School has been fortunate to receive assistance from the Oishei Foundation and WNY STEM to jump start our efforts to create clubs, programs and courses related to pre-engineering and computer science. We are pleased to accept this award and committed to providing experiences for our young men to prepare them for the opportunities and challenges they will face as they enter post-secondary education,” Cimusz added. 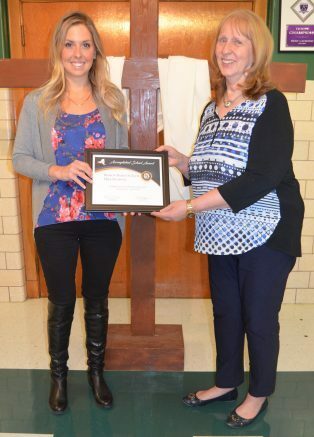 Be the first to comment on "Bishop Timon – St. Jude High School receives Accomplished School Award"